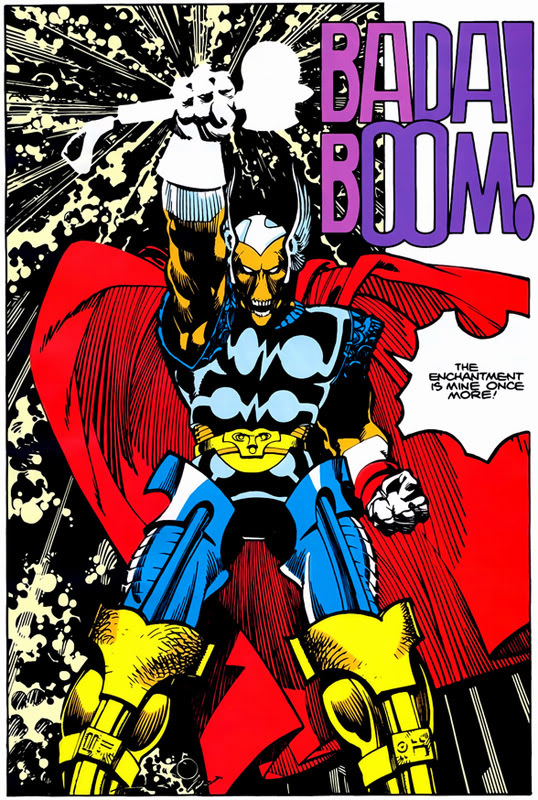 At the end of the last issue, Beta Ray Bill returned to Asgard carrying the unconscious Thor in his arms. We open to find the victorious Bill collapse due to his injuries. Odin orders the Imperial Guard (no, not these guys) to carry both warriors to the House of Healing. The attendants find Bill curious, but Lorelei finds him repulsive, saying that she’d “… sooner kiss a dog than be in the same room with him!” Sif enters at this moment, asking if her rival is “Recalling some past triumph?” There is some catty back and forth, all of which is observed by Odin, Lorelei leaves and Odin goes to visit the injured. He goes first to Thor, who is not happy at all, wanting to renounce his godhood in the wake of his loss. Bill is of two minds about the outcome. Where he is happy to have the hammer to defend his people, he is worried that someone else might come along and usurp his claim. Bill also worries whether he has a right to the weapon that was made for Thor, and Thor alone, regardless of what the enchantment says. Odin wishes to bestow a gift on Bill, in repayment for Bill sparring Thor’s life. We now switch to Nidavellir, the land of the Dwarves. A one-eyed wanderer greets a group of Dwarves, asking to share their fire for the night. Eitri, the leader, recognized Odin immediately and asks what his people can do for the gods. After a long night of talking, Eitri agrees to help Odin, but only if a woman comes to fight their champion. Should she win, Eitri will help Odin. Should she lose, she is to marry the champion and stay forever with the Dwarves. Two days later Thor and Bill are talking in the House of Healing and Bill reasons that Odin fixed the fight, sending them to a hot realm that would give Bill, a denizen of “a galactic inferno”, a decided advantage. Thor, knowing how sneaky Odin can be, vows to speak to his father upon his return. They both see Sif, fully armored, ride off “…as though The Wolf himself pursued her.” A nurse informs them that Sif has gone to fight the Dwarves champion on their behalf. As she rides, Sif flashes back to Odin telling her about the offer and her volunteering for the mission, as well as her musing how Bill, despite his appearance, is as valiant as Thor. Her thoughts are interrupted by Throgg the Dwarf, though he is the size of a small giant. The fight begins and we change scene again to Volstagg, still sitting on Agnar, recounting Balder’s fate. He tells how Loki crafted an arrow out of mistletoe and had another slay Balder, sending him to Niffleheim. On Earth a lighthouse keeper in Quebec is cursing a saleswoman who talked him into buying a food processor, which he has no use for. He hears a noise and thinks that she has returned, but then it grows louder and the whole lighthouse shakes. He tries to get out, but the lighthouse splits apart and a monster rises from the earth crying for vengeance. Back in Nidavellir, Sif and Throgg are still fighting. She cuts his hand, causing him to drop his club and charge her. She dodges and smacks him in the head with the flat of her blade, knocking him unconscious. Eitri appears and congratulates her on defeating their tormentor. It seems that Throgg used his freakish size to take over the Dwarf community, but now that he’s been defeated by a woman he’ll slink off and stop bothering them. Eitri commands the other Dwarves to stoke the furnaces so that they can get to work. 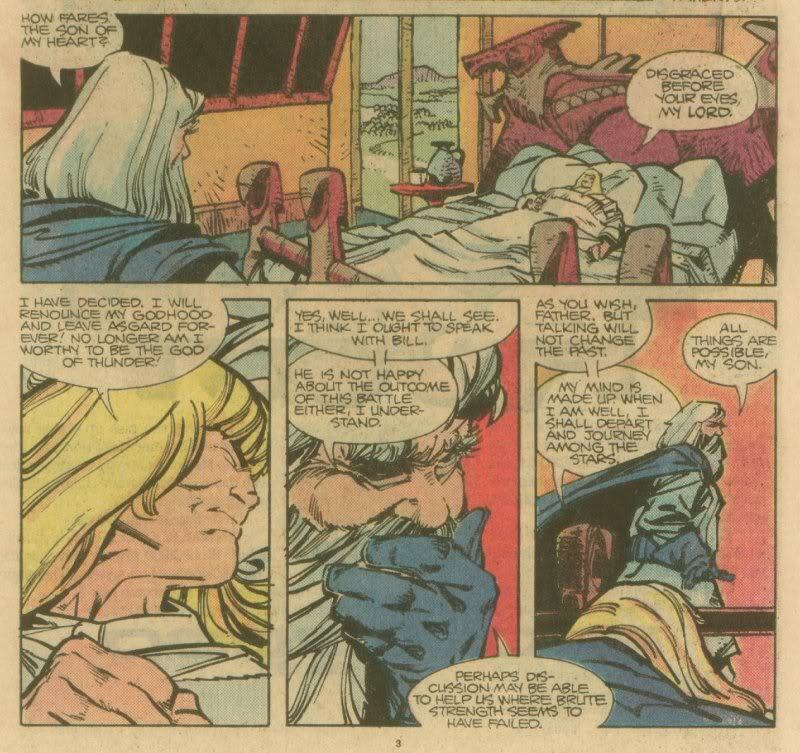 Sif returns to Asgard and has a tender moment with Bill, who tells her that he longs to get back to his people. Sif asks if he would ever return, but Bill says no, because when he was made a warrior he”… surrendered all my humanity and I have none left…for anyone.” He could not bear the thought of returning to such a perfect world as Asgard, simply because he would always be an outsider due to his monstrous body. The furnaces of Nidavellir are glowing with heat as the Uru metal is worked and poured into the mold. 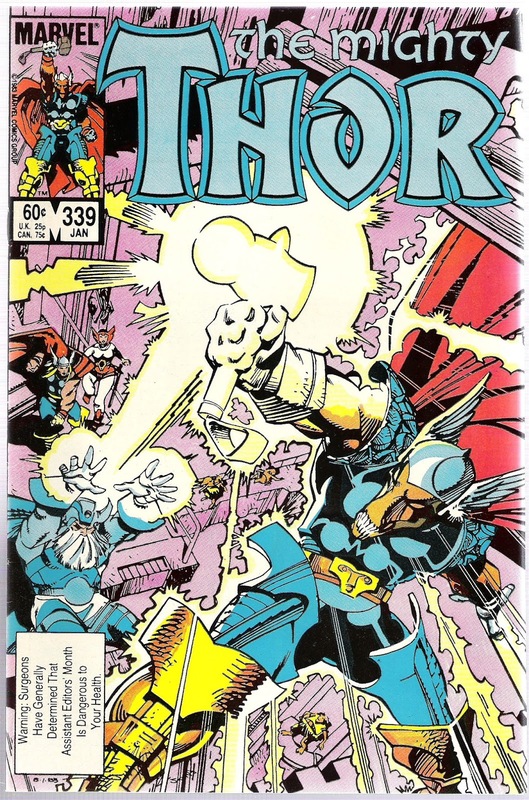 Odin casts his enchantment and Bill, wearing a protective glove, reaches into the molten metal and pulls out a hammer, which changes him back into Beta Ray Thor! Odin asks if Bill will accept the burden of carrying Storm Breaker and Bill does. Odin then returns Mjolnir to Thor and tells them to go back to Bill galaxy and destroy the source of the demons. 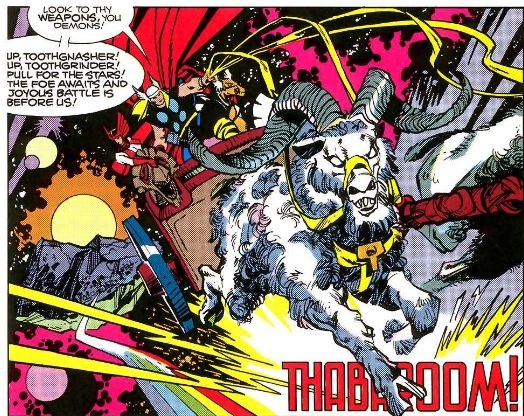 In order to travel as fast as possible, Thor summons his goat chariot. Thor, Bill and Sif climb aboard and head out to battle. Where it comes from: Bill, Odin and the Dwarves have now entered into a gift cycle, where anything someone receives requires reciprocation back to the other person. This is commonly, in Heathen circles, defined as “A gift demands a gain.” This is how mortals, such as yours truly, interact with Gods and Wights on a regular basis. We leave them gifts and they must reciprocate. Because Bill saved Thor’s life, Odin must give him a gift in return. Not should, must. In order to do this, he needs the help of Eitri and the dwarves, but they require a gift first in order to begin. At the end all of the gift cycles are satisfied and everyone’s honor is preserved. Eitri is a dwarf from the Lore, one of two that was responsible for the creation of Mjolnir, so he is the perfect one to go to if Odin wants another hammer of the same type created. Balder’s history is told here by Volstagg, and it is a touch off from how the Lore has it. Balder originally did not return until after Ragnarok, when the entire world was renewed by fire. Here, however, he did come back early, through the mechanizations of Odin, but he did not come away unscathed. Beyond his general rejection of life, we see that he has white hair. Prior to this his hair was brown, so the stress of going to the land of the dead had a profound effect on him. Finally, Thor’s chariot, pulled by Toothgnasher and Toothgrinder, is straight out of the Lore. In one story, Thor visits a peasant’s home and kills his goats to provide food for dinner. The next morning he puts the bones back in the skins and magically resurrects them. These goats, as we will see later, are quite big, probably around five feet at the shoulder, and are quite intelligent.